Qualitative research was the preserve of sociologists and anthropologists before it began making inroads into medical sciences. Qualitative research for years seemed unscientific to medical practitioners who were wedded to evidence-based medicine. To them, anecdotal evidence had no place in modern medicine. It was conveniently forgotten that most modern medical practices were based on meticulously collected anecdotal evidence of observant clinicians of yesteryears. Only recently were these practices replaced by what has come to be generally known as the scientific method. This is not to belittle the immense benefit of quantitative research but to reiterate that qualitative research has its own niche in modern medicine. Quantitative research methods or evidence-based clinical medicine generally set out to prove or disprove a hypothesis by "counting" the number of people who suffer from a particular condition, or symptom, or benefit from a specific intervention. The process basically compares population groups with or without a specific attribute, or characteristics, or those who benefit from an intervention, as against those who fail to show a positive response. Such methods are evidence-based, and the results are often based on meta-analysis. However, there are personal and sociological factors that tend to compound or counteract their prescriptions. A patient, due to personal or social compulsions, arbitrarily alters the dosage of medication, or might add to or subtract from the treatment regimen. An insight into these aspects is useful in such instances. Qualitative methods concentrate on exploring the role of beliefs, values, and, attitudes in human behaviour. They tend to reveal why the results of scientifically sound research are often not implemented in actual clinical practice. The goal of qualitative research is the development of concepts which help in understanding social phenomena in their natural rather than experimental setting. Unlike quantitative methods, where responses are categorized by their frequency of occurrence, and, thus lead to obliteration of each individual's characteristics, in qualitative methods, due emphasis is given to the meanings, expressions and experiences of all the participating individuals. Thus, in qualitative research, it is believed that each individual's perceptions should be given equal importance. Because health-care deals with people, rather than objects, there are entire sets of questions relating to complex human interactions, for which health professionals need answers. These answers to human behaviour are not provided by experimental or quantitative methods. That is where qualitative methods have great value. In recent years, a growing number of health professionals believe that quantitative and qualitative methods are not competitive models, but are actually complementary to each other. Integrating the two methods of research inquiry can help in the study of all aspects of a specific problem in much greater detail than can be obtained by the use of any one method. Qualitative methods can also be used in exploratory research for generating hypotheses, which can then be proven by quantitative methods. Similarly, qualitative methods can be used to phrase questions to be utilized in an interview schedule or questionnaire and are primarily useful to obtain information on a contextual or a cultural situation. 9. To verify data obtained from other research methods. How do people perceive low vision or blindness? What are the population's perceptions regarding causes of blindness? Understanding people's attitude to breast feeding in the prevention of vitamin-A deficiency. Determination of social risk factors like facial hygiene and poverty in the causation of trachoma and xerophthalmia. Ascertaining community treatment practices including home remedies for ocular conditions. The psychosocial impact of gradual loss of vision in the elderly due to Age Related Macular Degeneration (ARMD). People's perception of rural eye camps in the treatment of cataract. Identification of methods to improve community participation in eye-care activities. Attitude towards eye-care workers in the community. Preparation of questionnaires for surveys. Understanding reasons for non-compliance with medication in glaucoma and diabetic retinopathy. Understanding barriers to the uptake of eye-care services. 1. Sampling: Sampling is an integral part of qualitative research, just as in quantitative research. However, unlike in quantitative methods where probability sampling is the rule, qualitative research uses purposive sampling methods. Here, people are selected based on their ability to provide accurate responses and honest perceptions, rather than on demographic characteristics such as place or residence. Thus in qualitative research, representativeness may suffer, but validity (measurement of the 'truth') is very high. On the other hand, the special features of the individual can be captured as inputs in the treatment regimen. 2. Data analysis: Data analysis in qualitative research differs significantly from quantitative research. Data collection and analysis proceed concurrently and any questions or controversies raised during data collection are immediately clarified by reverting to the respondents, if necessary. Data analysis is not numerate, i.e., frequency counting. The actual words and expressions of the respondents are most important; this provides clues to the underlying perceptions. 3. Naturalism: In qualitative research, the emphasis is on understanding health behaviour in natural daily life situations., This is important because even evidence collected from a rigorous clinical trail may not be replicable in everyday life situations. For instance, it has been observed that in today's highly competitive world, some patients refuse to take medications at their workplace, because they do not want to be branded as unhealthy by their employers and thus risk their career prospects. 4. Relativism: While in quantitative research, the interviewer seeks a patient's response to a scientific issue and records the patient's responses on a predetermined scale, in qualitative research, it is believed that scientific 'reality' may look different from different perspectives. The interview is viewed as an amalgamation of two very different perceptions of reality. Thus the interview itself is a process of searching for answers rather than proving or disproving a point. 5. Triangulation: Triangulation is the process of validating different research methods against each other to look at the level of concordance between the methods. Methods are thus used in combination to validate results obtained. Triangulation can also be used to validate different investigators in order to eliminate potential bias, which could result by using a single investigator. There are many qualitative research methods. Each method has value in a specific situation. Some of the commonly used methods are listed in the Table. Observation and expression are among the basic tenets of research. In participant research, the observer actively participates in the group's activities, without revealing his identity. Such observation usually provides insights and leads to development of close interpersonal relationships, which are not possible with other methods of research. To understand the use of traditional eye medications in rural communities, historical recall may not reveal the actual practices followed, while observation can provide a wealth of information. The only problem with participant observation is that it is fraught with ethical problems, as the identity of the observer is not revealed. Sometimes the participant becomes emotionally involved in the group and this may bias the truth. Non-participant observation refers to discreet observation without actually participating in the activities of the group. In this method, interaction with members of the group is minimal and therefore information is likely to be distorted by the emotional involvement of the observer. The disadvantage however, is that the ascertainment of attitudes may be difficult. Such methods can be used to good effect in specific cases such as in dietary surveys to observe consumption of carotene-rich foods by families in the prevention of xerophthalmia, to observe the decision-making process involved in cataract surgery, or the behavior of a community towards the blind in their neighborhood, etc. A lot of work has been done recently to assess the functional status of individuals after cataract surgery and on the quality of life of these individuals. Studies have been conducted in India and Nepal to document the quality of life of operated cataract patients. All these studies have provided new insights into the benefits of cataract surgery. However, all these studies have depended on patient response based on historical recall. Though more time consuming and cumbersome, observational studies have the capacity to provide an even greater insight into how the patient is actually functioning in society. The mode of observation could either be structured or unstructured. In a structured observation format, the investigator records information in an ordered fashion and thus proceeds on observing and recording issues in a preconceived hierarchical manner. The investigator thus has less leeway to collect information, as he has to adhere to a specified format. The observation schedule is a type of preformatted proforma which is used to record the information. This is not popular with qualitative researchers because it tends more towards quantitative research, and, being rigid, tends to miss crucial information. Maps are another way of recording information. They are useful in a variety of situations. The number of contacts of a cataract blind individual with a health works in a village can be mapped out. In a similar fashion, mapping of all the cataract blind individuals in the village can be done. This will enable investigators to discern the characteristics of the blind in the village, which part of the village they hail from, the number of times they have visited the health centre to seek advice, and changes that may occur in the area over a period of time. Sociograms have become very popular in many fields. They help determine the patterns of interactions between members of a group. This can be used in group discussions very effectively. The pattern of interaction at the meeting of the District Blindness Control Society could be an example. A line drawn between the two persons interacting on an issue represents each verbal discussion at the meeting. This helps to gauge the level of interest among the members of a group and to specifically pinpoint those who seem unconcerned or disinterested [Figure - 1]. Sociograms are of immense value in planning community interventions where community participation is deemed essential. Network diagrams help in recording information on the decision-making social network that exists in an area. Studies have documented that many people are involved in the decision to undergo cataract surgery. A network diagram for decision making in cataract surgery is shown in [Figure:2]. It details the different people with whom an old widow interacts in her life and who can influence her decision. Such a network diagram has great implications for planning educational interventions as it provides clues to all those who should be focus of attention of a communication package designed to explain the benefits of cataract surgery, and motivate a patient to accept surgery. In unstructured observation, no limits or boundaries are predetermined and the situation is observed as it occurs. The aim is to observe behavior in a holistic manner, encompassing all aspects of the situation. The advantage of such an approach is that many unknown facets can be unearthed. Such observed behavior is generally recorded in the form of spot notes. Eye-care personnel are not unfamiliar with interview techniques. The process of interviewing brings the investigator and the respondent in a face-to-face encounter and attempts to understand the respondent's perspective. Interviews are an important means of obtaining information both in quantitative as well as in qualitative research. The essential difference, however, lies in the approach. In quantitative research, structured interviews are the rule while in qualitative research, they are the exception. Structured interviews use a pre-set format known as the interview guide which is followed rigorously. The interview guide sets out what is to be asked and in what chronological order or sequence. In a semi-structured interview some deviation from the interview guide is permitted. In the unstructured format, an interview guide is not used and the interviewer has almost complete latitude on deciding which questions to ask and how to ask them. The unstructured interview is the method most commonly adopted in qualitative research. The interviews should be conducted in environs familiar to the respondent. A busy clinic may not be right place, as the respondent's attitude may tend to be negative. Language and expression are of key importance in interviews. Knowledge of colloquial terms is very important for a successful interview. In an interview conducted on problems of reproductive health in a village in the Indian State of Haryana, a respondent constantly stated that all her problems were because "her roof had collapsed"! The interviewer was at a loss to understand the relationship between the lady's reproductive problems and the roof collapse. It was only later, when the health worker explained that in this region women referred to prolapse of the uterus as a roof collapse, that the interviewer appreciated the relationship! It was an apt description but to an interviewer who was unfamiliar with local terminology, it did not make sense. Unlike quantitative methods, in qualitative methods, dichotomous questions with only two possible alternatives are not a good idea. The respondent should be allowed to express what he/she perceives on that subject. Confidentiality should be strictly ensured for best results. It is not always easy to code and analyze the collected data. Replicability of the interview may not be possible. The interviews most commonly undertaken are called survey interviews where a number of respondents are interviewed in order to ensure representativeness. There are also some other special types of interviews. Career history interviews are specific types of interviews. Key informants are community members who are in a position to provide important information. They are not representative of the population as they are atypical, but they are in a position to provide more information and possess better communication skills or perspectives, compared to other members of a population. Such interviews can be used to ascertain the perceived benefits to a community by the provision of satellite eye hospitals or eye-camp services. Local government representatives (Panchayat leaders) and local school teachers may be able to provide information of this nature. Key information interviews are also important in epidemic outbreaks. They have a major role to play in the planning of eye-care services or specific program interventions. The career history interview is another special type of qualitative interview. Here the investigator concentrates on obtaining a broad account of a subject's professional life. Career histories of paramedical ophthalmic assistants and district-level eye surgeons can provide meaningful information on motivational levels, work satisfaction and expectations of individuals. This sort of interview is very useful in designing training courses or for restrucuturing job responsibilities. Focus groups are becoming increasingly popular in medical research. The technique was widely used in market research before being used in the health sector. In the focus group technique, a group of people are brought together and allowed to interact on a specified topic in the presence of a moderator. The focus group consists of 8-12 individuals usually with a similar background, and preferably not known to each other. The moderator facilitates the interaction with the help of predetermined guidelines. A larger group does not facilitate sufficient interaction. During the course of the discussions, the moderator does not intervene too much or lead the discussion, as that defeats the very purpose of focus groups. However, the moderator is usually firm and controls the more vociferous members of the group who tend to hijack the discussion, and cajoles the less vocal ones to participate. All proceedings are either audio or videotaped such that no data are lost. A rapporteur meticulously records the proceedings. The group dynamics help in producing a wealth of information that is never possible in a single one-to-one interview. Focus groups have been used to identify the concerns of blind people, to design questionnaires to assess functional status and quality of life outcomes after cataract surgery. A multicentric focus-group study was recently completed in the United States that aimed to identify the content of the National Eye Institute Visual Function Questionnaire. The study was able to identify content and aspects of visual disability that are not included in currently available vision-specific instruments, which are used to assess the impact of common eye diseases on visual functioning in everyday life. Similar studies are now being planned in different areas. Focus groups can also be used to understand population beliefs, behavior, and practice. They can also be used to evaluate existing eye-care programs or interventions or to plan new interventions. They can help in gauging the level of community concern and interest before embarking on any new activity. Focus groups produce a large amount of information in a short time and at a relatively low cost. They are an excellent means of obtaining information from illiterate groups. Their major disadvantages are that they may not be completely representative of the population and the analysis of data and transcription of recorded conversations is an extremely difficult task. An area of concern for most researchers is to improve the validity of the observations. Many a time, the investigator may feel that the respondent has not volunteered correct information but has given responses to please the investigator. The ultimate aim of research is to develop methods that will measure the truth. Unfortunately, there is no formula for truth. Hence methods have been developed that provide proxy information. Many methods like sentence completion, picture, interpretation, cartoon completion and story completion have been used for this purpose. In all these projective methods, sense is made of data by searching for underlying meanings of the stated expression, rather than the stated words themselves. These techniques have been extensively used in psychology and psychiatry. The expression of a respondent is actually a reflection of his perceptions. There are many barriers to an honest and meaningful communication between the investigator and the respondent. These include barriers of lack of awareness, rationalization of behaviour, inadmissibility of information to an alien investigator and the tendency to be polite rather than honest. Projective techniques can help surmount these barriers. Studies undertaken in India have highlighted certain barriers to the uptake of cataract surgery. These include a number of reasons, the most prominent among them being lack escorts, distance, and lack of mobility. Most of these identified barriers have been expressed by respondents, and have been considered at face value. Thus there is no concrete evidence to show that efforts to surmount these barriers actually result in improved performances. This could owe to underlying emotion or perception which is ignored or overlooked by conventional research methods. Many a time widows with cataract blame the onset of blindness to excessive crying after the death of their partners. It is likely that the underlying cause may be due to the sense of loss and despair after the loss of a spouse. It may be due to the depression and sense of worthlessness that descends on the surviving partner and this may find expression in different ways, i.e., "nobody cares for me any longer"; "nobody seeks my opinion now" or "if my spouse was alive, this would never have happened". In these situations, motivating a patient for surgery may need solutions far beyond the scope of the common barriers to surgical uptake. This may be the reason why even in New York City in the 1980s, more than half the cataract-blind individuals had not opted for surgery within a year of diagnosis of an operable cataract. Unless efforts are directed to tackle the depression, it will not help matters. Such a patient may continue to be unhappy even after a good visual outcome following surgery. In such situations, projective techniques may be very useful to gain an understanding of the an individual's mindset. Recounting of personal experiences or respondents is also valuable tool in qualitative research. The respondents are asked to maintain records like diaries, in which the relevant information is recorded. To gain an insight into maternal characteristics responsible for compliance with eye-care programs like mega-dose vitamin-A supplementation, female health workers can be asked to record information relating to mothers who refuse vitamin-A supplementation. This will help plan strategies to surmount barriers to the uptake of a specific service. Critical incident recall is another modality for conducting qualitative research. The respondents are asked to recall an incident from the past, in relation to a specific subject, which caused them undue worry and anxiety. This method can be used extensively in evaluating services provided by an eye-care facility. The evaluation can then be used to improve the services provided by the facility. The respondent can be asked to explain in detail, the unpleasant experiences at the hospital. Stories are another means of obtaining information on perceptions of people. A group of operated cataract patients can be asked to share their experiences of the surgery and the benefits which accrued, with a group of operable cataract cases. The use of the aphakic motivators falls in this category. Surgery was costly and unaffordable. Based on the ranking of the issues by the respondents, the sociologist was able to suggest remedial measures. In assigning ranks to prioritize issues, it is preferable that the respondents have a wide choice to select from. Too few choices would limit the patient's perspective. The case study is also an important research method in qualitative inquiry. It involves detailed examination or observation of a single individual or event or of a few such units. The case study can also be used to generate rich subjective data that can aid in the development of testable hypotheses. 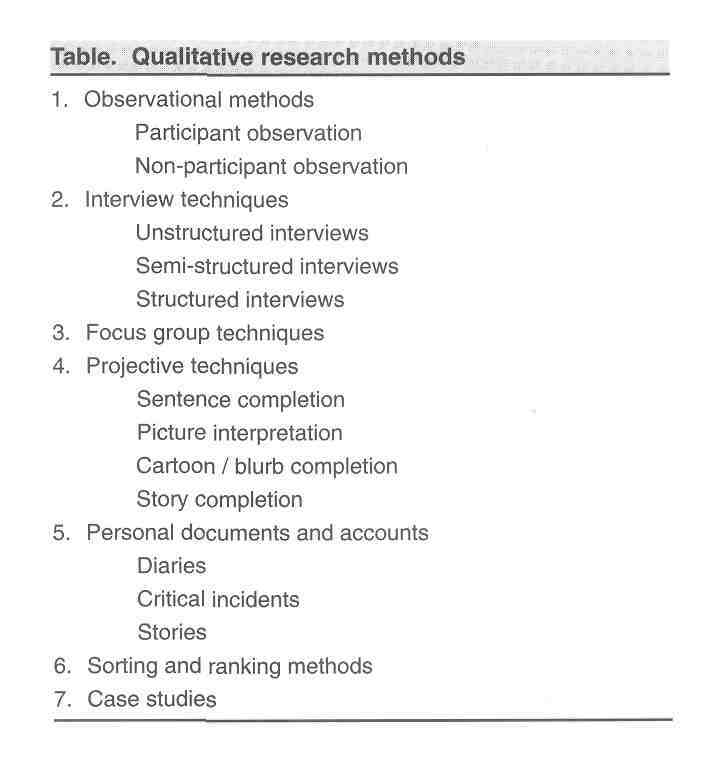 Different types of case studies are used in qualitative research. Observational case studies are usually conducted over a long period of time. Oral history case studies refer to the collection of first person narratives obtained by extensive interviewing. Clinical case studies examine the patient in exhaustive detail to generate hypotheses regarding causation or for chronicling clinical manifestations. It is important to realize that research methods of a quantitative nature have limitations in dealing with complex human interrelationships, which have a bearing on the health and well being of populations. This in no way means that evidence-based medicine is not relevant, but an admission that different problems need different applications of research methods. Qualitative research can help investigate clinicians' and patients' beliefs and preferences and how recommendations or prescriptions are translated into practice. The main value of qualitative research lies in its ability to unravel some mysteries of the social factors in the web of causation of disease and utilization of health services, which are not amenable to research by traditional quantitative methods. Mays N, Pope C. Rigour and qualitative research. Br Med J 1995;311:109-12. Haines A, Jones R. Implementing findings of research. Br Med J 1994;308:1488-92. Pope C, Mays N. Reaching the parts other methods cannot reach: an introduction to qualitative methods in health and health services research. Br Med J 1995;311:43-45. Jones R. Why do Qualitative Research? Br Med J 1995;311:12. Yach D. The use and value of qualitative methods in health research in developing countries. Soc Sci Med 1992;35:603-12. Green J, Britten N. Qualitative research and evidence based medicine. Br Med J 1998;316:1230-32. Adams S, Pill R, Jones A. Medication, chronic illness and identity: the perspective of people with asthma. Soc Sci Med 1997;24:167-82. Borg WR, Gall MD, editors. Educational Research-An Introduction. Essex, UK:Addison Wesley Longman; 1989. p 392-401. Ellwein LB, Fletcher A, Negrel AD, Thulasiraj RD. Quality of life assessment in blindness prevention interventions. Int Ophthalmol 1995;18:263-68. Fletcher A, Vijaykumar V, Selvaraj S, Thulasiraj RD, Ellwein LB. The Madurai intraocular lens study. III: Visual functioning and quality of life outcomes. Am J Ophthalmol 1998;125:26-35. Pokharel GP, Selvaraj S, Ellwein LB. Visual functioning and quality of life outcomes among cataract operated and unoperated blind populations in Nepal. Br J Ophthalmol 1998;82:606-10. Fletcher AE, Ellwein LB. Selvaraj S, Vijaykumar V, Rahmathullah R, Thulasiraj RD. Measurement of visual function and quality of life in patients with cataract in southern India. Arch Ophthalmol 1997;115:767-74. Mays N, Pope C. Observational methods in health care settings. Br Med J 1995;311:182-84. Goyal M, Gupta SK, Verma L, Murthy GVS. Socio-demographic parameters of utilization of camp based cataract surgery in rural India:a case study. Asia Pacific J Ophthalmol 1996;8:15-18.
WHO. Kikawila Study Group. Teaching materials from a TDR Workshop: Social and economic research in tropical diseases. Resource papers No.3 (TDR/SER/RP/94.2) UNDP/World Bank/WHO publication. Geneva; WHO; 1994 p 10-17. Britten N. Qualitative interviews in medical research. Br Med J 1995;31:251-253. Khan ME, Anker M, Patel BC, Barge S, Sadhwani H, Kohle R. The use of focus groups in social and behavioral research:some methodological issues. World Health Stat Q 1991;44:145-49. Morgan DL, Spanish MT. Focus groups:a new tool for qualitative research. Qualitative Sociology 1984;7:253-70. Mangione CM, Berry S, Spritzer K, Janz NK, Klein R, Owsley C, Lee PP. Identifying the content area for the 51-item National Eye Institute Visual Function Questionnaire. Arch Ophthalmol 1998;116:227-33. Kitzinger J. Introducing focus groups. Br Med J 1995;311:299-302. Oppenheim AN, editor. Questionnaire Design, Interviewing and Attitude Measuremen. London, UK:St. Martin's Press;1992. p 210-28. Gupta SK, Murthy GVS. Where do persons with blindness caused by cataracts in rural areas of India seek treatment and why? Arch Ophthalmol 1995;113:1337-40. Brilliant GE, Brilliant LB. Using Social Epidemiology to understand who stays blind and who gets operated for cataract in a rural setting. Soc Sci Med 1985;21:553-58. Keen J, Packwood T. Case study evaluation. Br Med J 1995;311:444-46.